We gather together, then what? Chef Michael Hirst to the rescue. Here, he offers top tips to keep the turkey moist and the rest of the meal worthy of giving thanks. 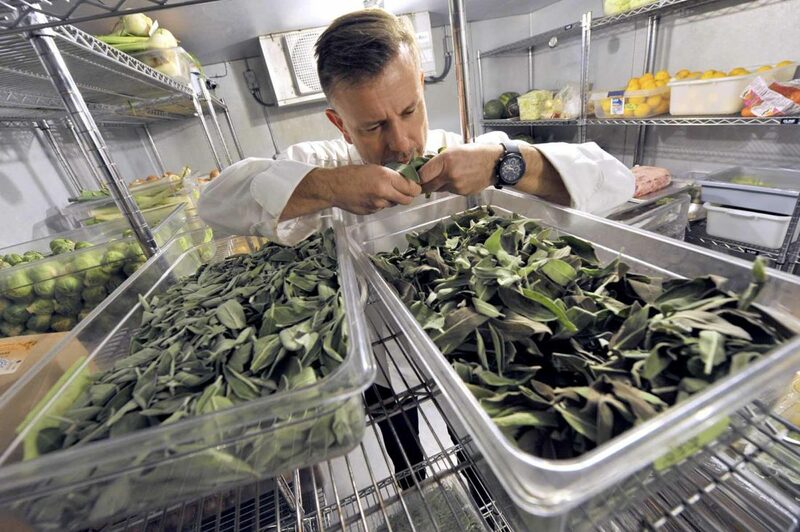 Chef Michael Hirst, director of the Iowa Central Community College Culinary Arts program looks over several trays of fresh sage that will be used in several Thanksgiving recipes. 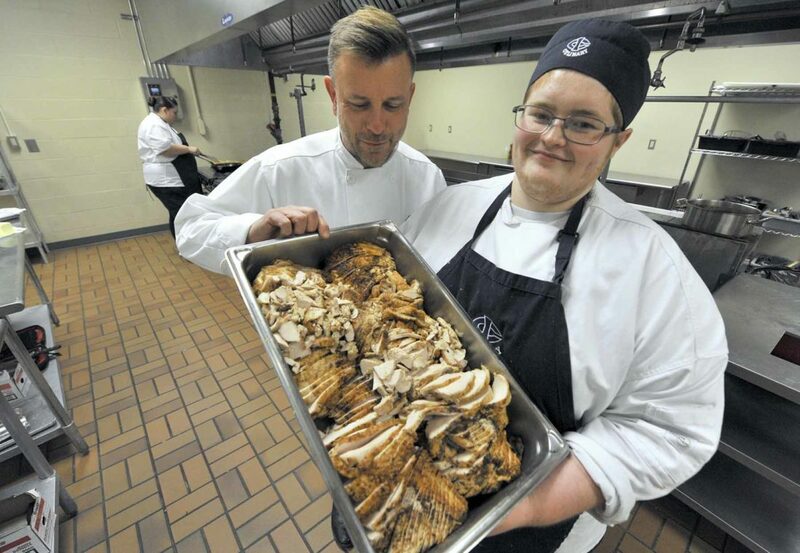 Chef Michael Hirst, director of the Iowa Central Community College Culinary Arts program, looks over a tray of prepared turkey with second year student Devin Stuhr, of Massena, at right. 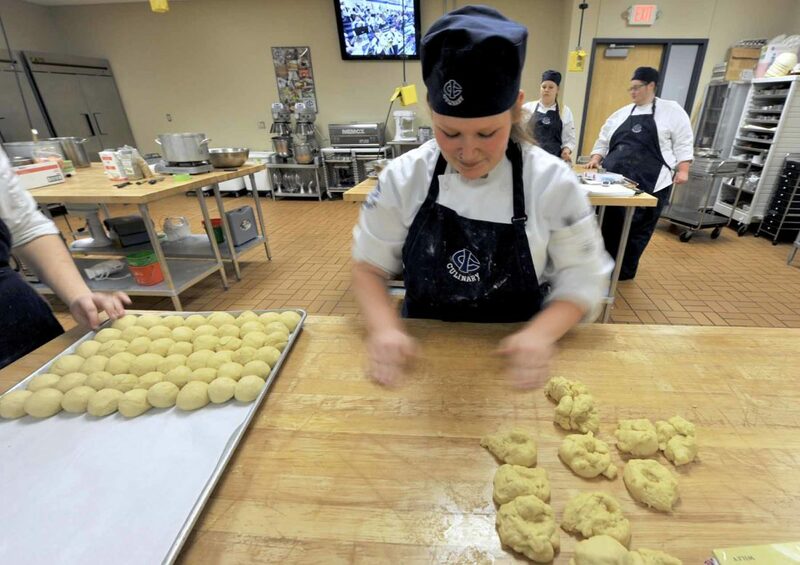 First year Culinary Arts student Savana Allbree, of Fort Dodge, rolls out buns that will be baked for Thanksgiving in the baking center at Iowa Central Community College recently. For some it’s just not Thanksgiving without a slice of pumpkin pie. 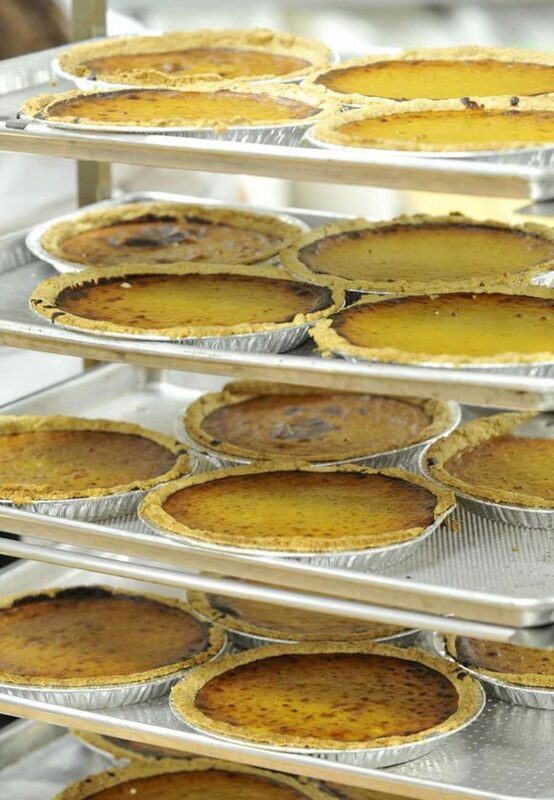 Here a rack of freshly baked ones sit ready for Thanksgiving dinner at Iowa Central Community College. It’s one of those moments that’s not on the list of things wanted as the family sits down to enjoy Thanksgiving dinner: everyone realizing that their slice of turkey has a moisture level approaching hot sand from the Mojave desert. Dried out turkey is one of the most common banes of the annual feast. Chef Michael Hirst, the head of the Culinary Arts Program at Iowa Central Community College, said there are ways to avoid this problem. “Brining helps that a lot,” he said. “Immerse the bird for 24 hours in a salt water solution in a five-gallon bucket. Add enough water to cover and about two cups of salt. While most birds have water injected during their processing, Hirst said much of that oozes out as the bird is thawed. “It gently permeates the bird. The salt acts like a clotting agent. You’re adding the moisture just before you cook it,” he said of the brining process. The bird can also dry out in the oven. “Cover it for about three-quarters of the cooking time,” he said. After that, it’s on to some serious basting. Hirst is not a fan of stuffing the bird — with stuffing. That doesn’t mean he he cooks an empty bird. He instead puts a variety of ingredients to help flavor the bird. He suggests a mix of onion, garlic, sage, rosemary and thyme. “Roughly mashed and placed inside,” he said. He also suggests sticking with the tried and true oven. He doesn’t recommend the oil-filled turkey fryers. One other option that he does recommend, and uses regularly, is to debone the turkey before cooking and then preparing the individual pieces. “It’s a lot more time-friendly,” he said. Carving the bird can be made easier, he said, if the legs are removed first. Also, the bird needs a bit of time to “rest” before letting Uncle Joe fire up his electric carving knife. One mystery that has eluded many family cooks over the years is how to make sure all of the various dishes arrive table side at more or less the same temperature. So how does one avoid serving lukewarm turkey paired with mashed potatoes that are the same temperature as molten lava? Hirst has one final suggestion for Thanksgiving dinner. • Side dishes for the Thanksgiving meal, ranging from the traditional mashed potatoes, mashed sweet potatoes or yams, string beans to cranberry sauce can be improved with just a few simple tips. Whatever one is mashing, Hirst said, the extra ingredients must be hot. • Brussels sprouts are often on his own table — the veggie so many love to hate is actually delicious when prepared properly. • Green beans can be improved on a lot over simply boiling them. • If you want to ruin Chef Hirst’s Thanksgiving dinner, serve him a slab of cranberry sauce with the can rings intact. 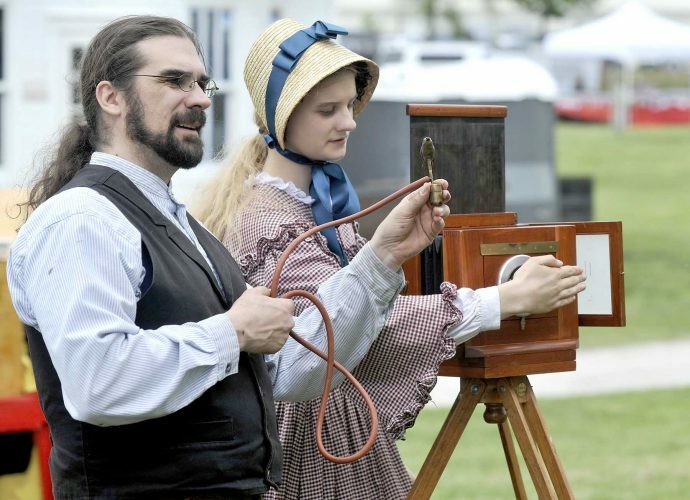 This year, the cranberry he and his students are preparing follows a different recipe. The cranberry is important for balancing the plate’s flavor profiles. • Dessert at Thanksgiving is usually pumpkin pie — it is, after all, traditional. That pumpkin spice thing that’s currently trendy in almost everything? He’s not a fan. • So, no pumpkin spice latte to drink with the meal. Hirst offers some other pairings. For the under 21 guests? “A sparkly cranberry cocktail with soda and orange peel,” he suggested.